A 69-year-old man complained of blurred vision with no relevant medical history. He also mentioned that he needed to get new spectacle lenses, as it had been 3 years. His best-corrected visual acuity determined by the Snellen scale was 20/25 in both eyes. The photograph shows polychromatic and highly reflective, needle-shaped opacities in the left lens. 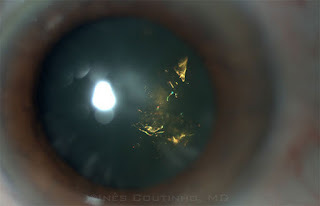 Christmas tree cataract is typically idiopathic or associated with myotonic dystrophy. Because the cataract did not cause a significant decrease in vision, it was not removed but monitored for progression.